Greek warriors, warriors relief, greek relief, greek art, greek reproductions, greek gifts, greek, museum reproductions, greek statues, statues,greek sculptures. Piraeus Museum, Athens. 410 B.C. This scene comes from the grave stele of Chairedemos and Lyceas, two young athenian hoplites (Greek infantry soldiers) who died fighting during the Peloponnesian war. During this war, Athens and their allies lost the war against an alliance of Greek states led by Sparta which challenged Athens imperialistic ambitions. Greek infantry usually fought in formations (called phalanx) of several men deep in a long battle front. The soldiers of this phalanx were equipped with a bronze helmet, breastplate, greaves (shin guards) on the leg, round shield, long spear and a short sword. Light armed soldiers skirmished on the flanks with javelins, slings and bows and arrows. 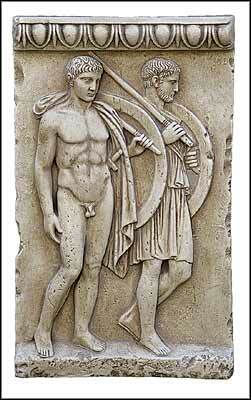 Since warriors had to provide their own equipment, only the well to do farmers served in the Phalanx. Only the wealthiest soldiers could ride to the battlefield on horseback and then dismount to fight on foot.